Contest is over can someone explain this https://www.codechef.com/COON2019/problems/CDRN02 problem. 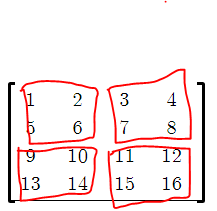 for the test case provided i understood when A army fort is 3x3 and B army attacks like this in 2x2 . if i considered B army is 2x2 again and the A army fort is 4x4. then the output would be 4 right ? if this would be answer why the problem tester didnt provide another test case or explain it well if so many beginners like me would had understand . The problem was not explained well at all. you mean the question in the contest?